LFI’s new Pledge for Gaza campaign is part of our long-standing work to encourage the economic revitalisation of the coastal enclave. We are inviting Labour parliamentarians to sign the five-point plan. It seeks to provide a multifaceted response to the challenges facing Gaza. If you are in a Labour constituency, please write to your MP asking them to support the Pledge for Gaza. You can read LFI chair Joan Ryan’s op-ed announcing the campaign here. 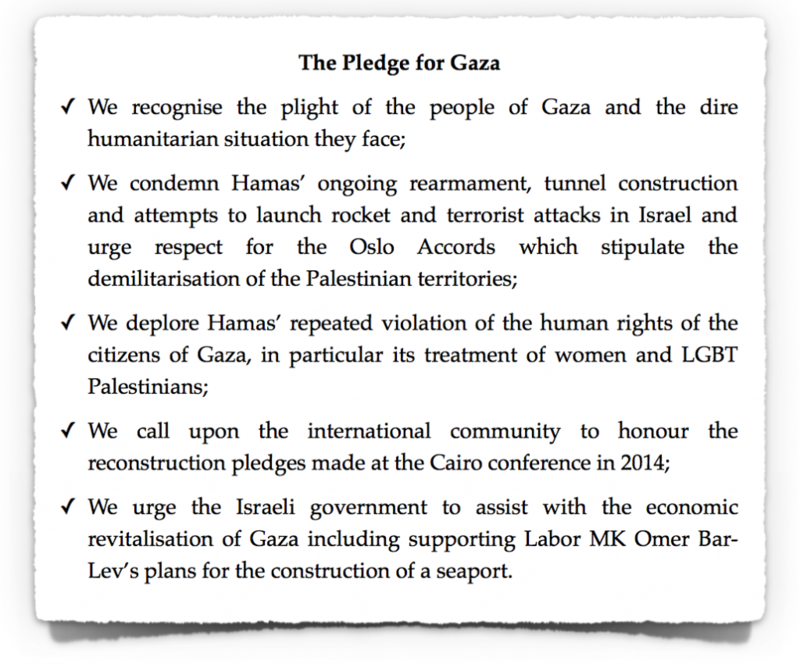 For more information about our Pledge for Gaza, please see the campaign briefing here. Please support our campaign – ‘For Israel, For Palestine, For Peace’. 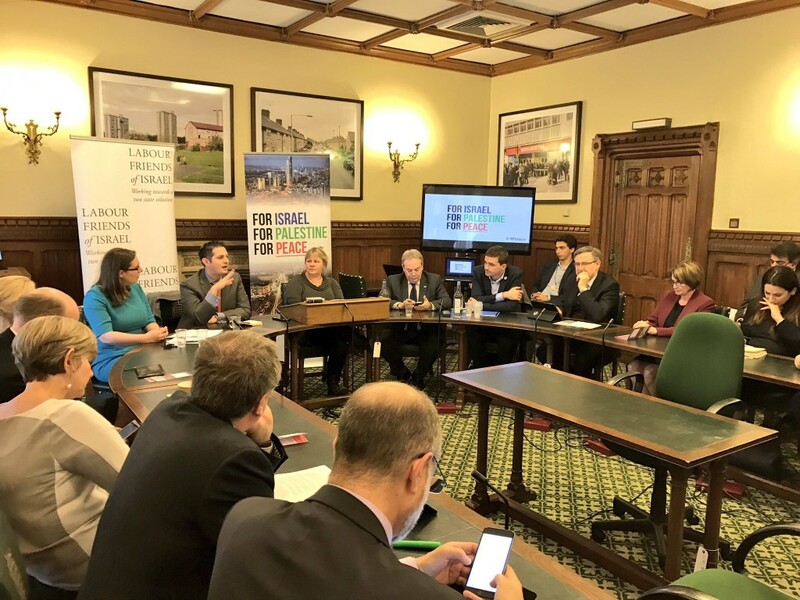 LFI’s campaign – ‘For Israel, For Palestine, For Peace’ – aims to persuade the British government to support the creation of an International Fund for Israeli-Palestinian Peace; a fund designed by the Alliance for Middle East Peace to boost spending on coexistence work. Already, we have persuaded the government to increase its support for coexistence projects from £0 in 2016/17 to £3m over the next three years. This is a huge step forward in LFI’s five-year campaign to secure more investment in this vital work. But this new funding must act as a catalyst for the creation of an International Fund to ensure support for co-existence projects is both long-term and sustained. The fund would aim to leverage and invest $200m in people-to-people work split roughly equally between the US, Europe, other international partners including the Arab world, and the private sector. The fund is not intended to replace support that would otherwise be provided directly either to the Palestinian Authority or to Israel. As Britain found in Northern Ireland, broad popular support is an essential underpinning for any successful peace process. Over the two decades since the signing of the Oslo Accords, an extensive and growing network of NGOs has worked at a grassroots level to foster the values of coexistence, peace and reconciliation between the Israeli and Palestinian peoples which will be required if any future settlement is to be sustainable. Such people-to-people work is already evident in all kinds of fields. From sports clubs for children and young people to environmental, cultural, economic and interfaith projects, the job of building positive relationships across conflict lines has already commenced. However, despite the huge investments made by the international community in the peace process, coexistence work has not been viewed as an essential part of this investment. Crucially, the intent behind the International Fund is to bring additional resources to solving this conflict by highlighting a critical need to support civil society projects and by unlocking large-scale project opportunities not possible with current resources. The fund is not intended to receive support that otherwise would be provided directly to either the Palestinian Authority or to Israel. We at LFI feel now is the time to start prioritising coexistence work to lay the foundations for a lasting peace. To find out more about the campaign, please see our campaign pack. Read an interview with Joel Braunold from Alliance for Middle East Peace and John Lyndon from OneVoice about the fund here. We write to ask you to support the creation of the International Fund for Israeli-Palestinian Peace. Modelled on the highly successful International Fund for Ireland, the International Fund for Israeli-Palestinian Peace has been designed by the Alliance for Middle East Peace – a coalition of over 90 organisations building people-to-people cooperation and coexistence – to leverage and increase public and private contributions worldwide, funding joint economic development and civil society projects that promote coexistence, peace and reconciliation. Despite the huge investments made by the international community in the peace process, coexistence work has not been viewed as an essential part of this investment. Britain’s spending in Israel-Palestine exemplifies the problem. As you will be aware, less than 13 percent of the £1.14m spent by the Conflict, Security and Stability Fund in Israel-Palestine is on people-to-people projects. Without sufficient funding – either from governments or private philanthropy – coexistence projects are currently only able to have a limited impact. Operating at scale and properly funded, they could, however, help to build powerful constituencies for peace in Israel and Palestine, forcing leaders in both countries to return to meaningful negotiations. We urge you to both support the creation of the International Fund for Israeli-Palestinian Peace, and to show Britain’s commitment to this vital cause by increasing spending on coexistence work. To show the impact co-existence projects can have, here are two quotes, one from an Israeli and one from a Palestinian, who participated in MEET (Middle East Entrepreneurs of Tomorrow). MEET connects, educates and empowers the next generation of young Israelis and Palestinians to become a network of leaders for positive change through technology and entrepreneurship.